If you’re a website owner who relies on online traffic to generate leads and revenue, you probably know all too well that SEO mistakes—even the smallest ones—cannot be a laughing matter. They can become very costly. The only way to ensure that you’re not making inadvertent mistakes with your content is to regularly analyze its performance using Google Analytics and continually stay up-to-date with the latest SEO templates. Long gone are the days when stuffing your content with keywords could get you anywhere in Google’s search results. But the mentality behind this outdated and ineffective tactic still exists: That you can achieve impressive results by creating content for algorithms rather than people. This is why many content creators often make the mistake of targeting keywords or key phrases with content that doesn’t match search intent; or, worse still, they make the mistake of targeting keywords that don’t even align with the content of their posts. Let me give you an example: If you search for the key phrase “best video editing software,” you’ll find several informational blog posts comparing top tools for editing videos, not commercial pages. 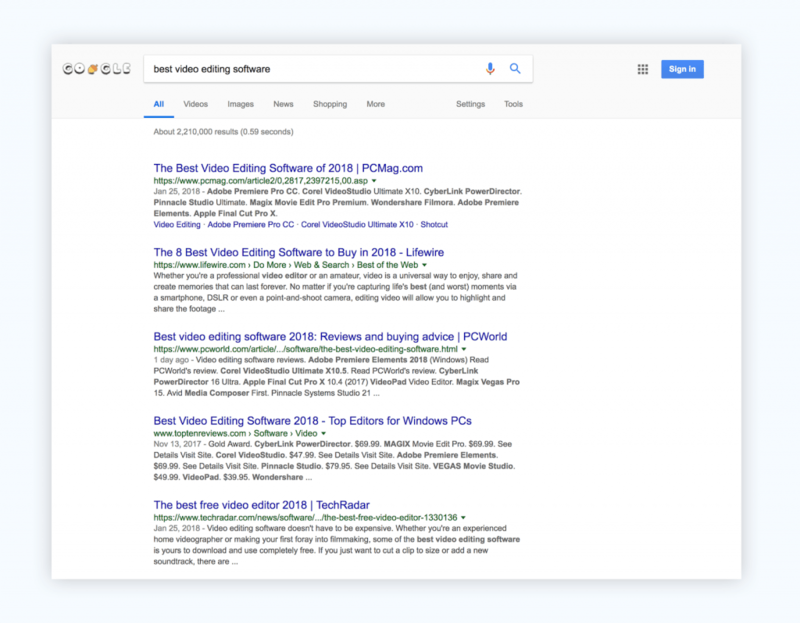 Since Google is constantly tweaking its algorithm to satisfy searchers’ needs, it’s a safe bet that the intent of most people who search for this term is to find software reviews rather than the landing page of any specific tool. But a content creator who fails to consider search intent can easily make the mistake of creating a landing page to target this key phrase rather than an informative blog post, which would have a much better chance of ranking on page 1. So, next time you want to target a key phrase, make sure to look at the other pages already ranking for it to decipher the actual intent behind the search terms used by people. Another common mistake is targeting keywords that are too general, instead of going after long-tail keywords that convert better. Here is an example from personal experience: A few years ago, we were considering optimizing our presentation landing page to target a keyword like “presentations” so that it would bring in a massive amount of consistent traffic year-round. We didn’t realize at the moment, however, that a long-tail keyphrase like “best presentation software” would convert at a much higher rate and bring in more qualified leads, rather than readers who were merely looking for information but were not ready to purchase. One of the ways Google determines if your content will be relevant to a searcher is to detect if other topically related keywords appear in your content. Some SEO tools such as Moz also come with built-in Related Topics features. Everyone wants to rank in position number 1 for a keyword, but what about so-called “position zero”? Many content creators overlook the possibility of earning this coveted position because they haven’t taken the time to research these high-traffic (and, many times, high-converting) opportunities. A few years ago, we were lucky enough to appear in one of these, and our traffic for that particular post increased exponentially overnight. 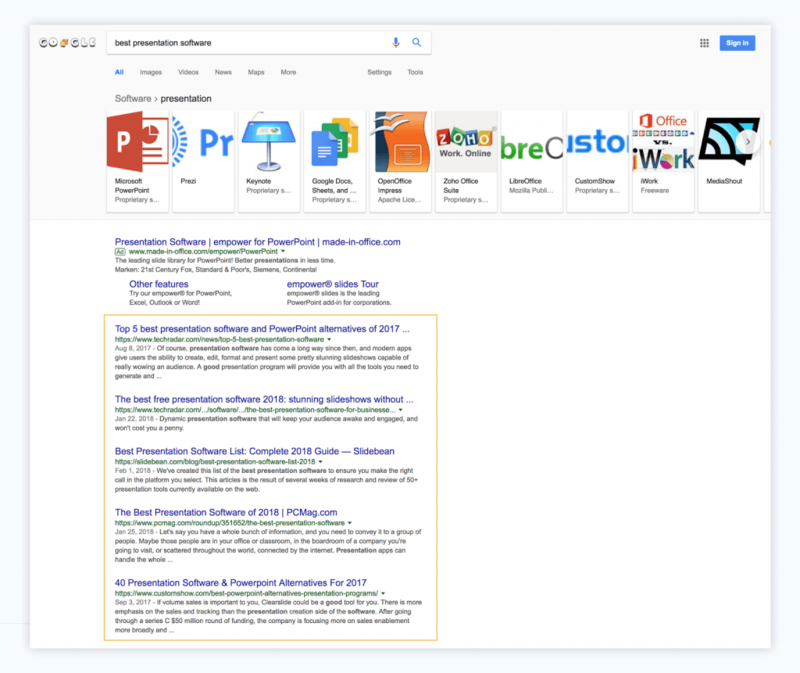 Without knowing it, we had formatted our post to be “Featured Snippet friendly” and were reaping the rewards not only in traffic, but also added credibility due to appearing in a Google SERP feature. We wrote all about our experience in this post. 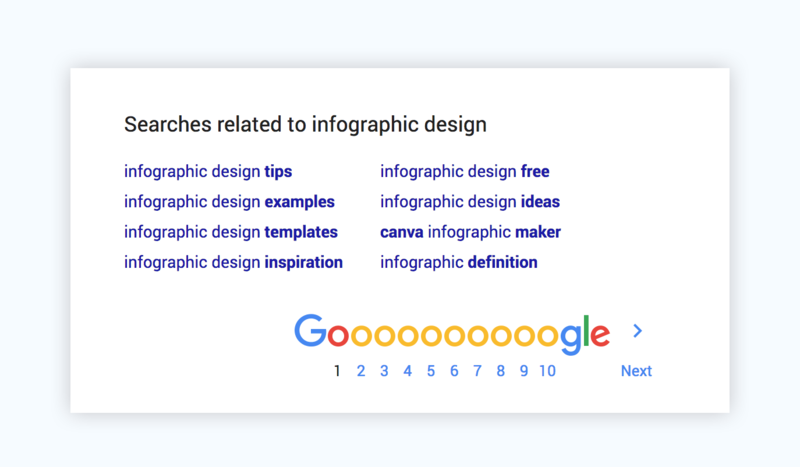 For example, if you want to appear in “position zero” for the key phrase “how to make an infographic,” you should first do a quick search of the term and then analyze the format of the Featured Snippet. In this case, you should use the key phrase in an H1 or H2 tag and then, directly below it, insert numbered steps in H2 or H3 tags, with clear directions for each subheading, within paragraph tags. Another common mistake is not ensuring that your headline stands out among dozens of others just like it on Google’s Search Results Page. Let’s say you’re targeting a keyword like “best presentation software.” You’ll find several headlines with the same exact structure and wording. Now imagine you’re the person searching for informational pages on best presentation software reviews. Which headline would you click on? If all of them look very similar, you’d probably just click on the first one. So, to distinguish yours from the rest, make sure to adjust it so that you’re targeting your key phrase and, at the same time, also appealing to human readers. Just remember not to fall prey to clickbait and deliver what you promise in your headline. You’ve probably read plenty of studies that assert that content with at least one image performs better than content with no images at all. But many website owners and bloggers forget to make the most of their images when it comes to SEO. If you create custom images for your site (as we always do), then you want to make sure that all the hours invested in your unique content are also paying off on search engine results. For example, if you’ve created an informative, standalone graphic, like the one above, then you should use a descriptive title with keywords and relevant alt tags to explain the content of your image to increase its chances of appearing at the top of Google Image Search results. 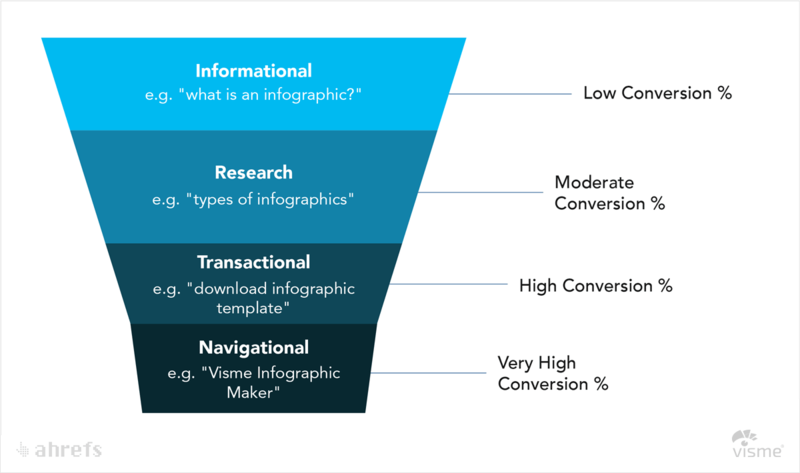 Another frequently overlooked aspect of “visual SEO” is the fact that informative images such as mini infographics and well-designed charts are often picked up by sites and bloggers who have published related content in the past. To get the highest ROI for your custom graphics, pitch mini infographics and well-designed charts to external sites and watch as the links back to your site start to roll in. Lastly, make sure to claim any backlinks from sites that have used your images without adequately citing you as the source. How do you find them? Do a reverse Google image search for your infographic or custom graphic and look at the top pages that include matching images. If you happen to find any that don’t link back, reach out to them and politely ask them to provide the attribution you rightly deserve. Which of these simple SEO rules have you overlooked? Which have given you the best results? We would love to hear from you in the comments section below.